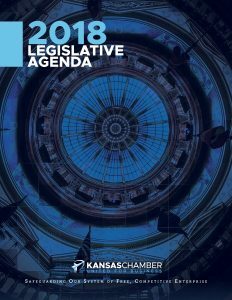 Topeka, KAN., (February 6, 2018) – The Kansas Chamber 2018 Legislative Agenda advocates for a healthy economy through public policies that strengthen the state’s business climate. The agenda is based on extensive input from Chamber members and the state’s business community. “Throughout our legislative agenda development process, our members reiterated the Kansas Chamber’s core principles of free enterprise and removing obstacles that impede job creation and slow economic growth,” said Alan Cobb, Kansas Chamber President and CEO. The Chamber used the feedback from meetings with the Chamber Board of Directors, Cornerstone members and task groups, along with the results of its Annual Business Leaders Poll and Annual Competitiveness Index, to frame the state’s key business issues in this agenda. The agenda covers eight areas of public policy including taxation, regulatory affairs, legal reform and education. “The core focus of the Kansas Chamber’s work at the Statehouse during the 2018 legislative session will be on protecting the business community from increased costs through higher taxes, user fees and revoked tax exemptions while also protecting pro-business gains made in recent years,” said Cobb. Cobb acknowledged the Kansas continues to face challenging times. “But the Kansas Chamber and its members believe working together with Governor Colyer and the Kansas Legislature, we will be able reduce the cost of doing business in Kansas so we can keep jobs and grow our economy faster,” Cobb said. Click here to read the Chamber’s 2018 Legislative Agenda.